1. Ever heard a cinnamon roll called a snail before? 2. Do you have any funny names for food where you live? If you enjoyed this post, I invite you to get updates. Just click the Get Updates button in the sidebar below the Portfolio Thumbnails, or click + Follow in the blog menu bar. Oh, No– Abducted By The Cake People!! Oh Waiter, There’s A Fly In My Dinner, But Who’s Complaining?? I did some research, because my linguistic and etymological interests JUST won’t leave it alone. I don’t think the origins lie in California. See https://snacktime.wordpress.com/2007/03/29/what-the-heckens-a-schnecken/ as well as the Wikipedia entry for Schnecken. “Schnecken” apparently means “snails” in German and was brought to the U.S. by Jewish immigrants. It’s still known in Germany by “Schnecke” (snail). Apparently, the name for this German variety of sweet bun was more broadly applied to other types of sweet buns, and became known outside of Philadelphia and Baltimore. The only firm reference I could find to sweet buns being called “snails” instead of “Schnecken” or “Schnecke” is the Cinnamon Snail, a vegan food truck that appears to operate in the metro New York/New Jersey area. They have their own website and were mentioned in the Gothamist. A reference in California has come a long, long way, then! Thanks for your research, Jak. I’d never heard of a schnecken, but I can tell you this: I’m ready to sign on for a plateful right now!! They sound delicious. 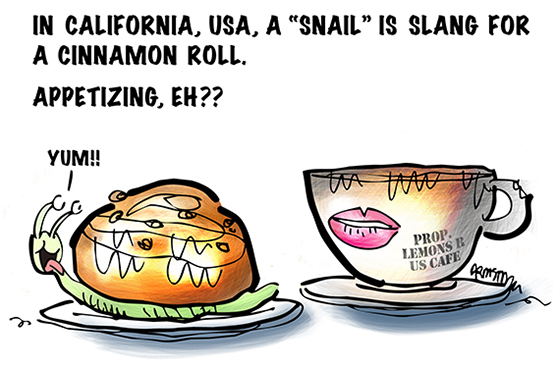 I’ve done some googling myself, and I’m ready to conclude that a “snail” is a pretty common term for a cinnamon roll– it certainly doesn’t appear to be unique to California. What inspired my post: the Word Power feature in an old Reader’s Digest. It featured words taken from the Dictionary of American Regional English (Harvard University Press). California was sited as the primary region where “snail” is used to denote a cinnamon roll. Many thanks for your kind comment and support. My wife is laughing and says you played “hook jak” wonderfully. I was indeed hooked. Haha I’ve never heard of a cinnamon roll called a ‘snail’ before! Always great to see you, thanks for stopping by! The “toad in the hole” I learned was an egg cooked in the hole of a toasted bread slice. Actually, I learned the “Tuna del Monaco” variation first, which added a tuna-style gravy. Ooo. I think it’s delicious, but I guess my description doesn’t do it justice. A snail roll? That sure doesn’t sum up the sugary-sweet concoction I love. Ewww! Bu, Mark, I’m sure if you were hanging out in a diner that you’d hear many odd names thrown around by the waitress to the cook that would have you in stitches. The only one that comes to mind right now is not appropriate for a family-friendly blog. I wouldn’t like to think of having to dive myself into a freshly baked snail…. Love the illustration Mark! Though it looks like the snail may eat itself because it smells so delicious! Poor thing. I don’t know really of odd-named city-based foods here in London, but in the UK itself there is an English dish called Toad in the Hole: sausages in Yorkshire pudding batter, with vegetables and onion gravy. Personally I’m not a fan of it as I like my Yorkshires non-soggy, but for others it is yummy! Delighted as always, and thank you for your non-soggy support!! A word we use for candy in New Zealand is lollies. Another is the word greasies – for fish and chips. Always good to see you, thanks for leaving tire tracks on my blog! Horehound Slugs It’s real, it’s New England and my mother loves them. Very old(e) type of candy but calling it a “slug” is a little less than appetizing…kind of a snail without the shell. I put a pic in my blog Top 10 Worst Excuses for Candy – Ever! http://wp.me/p13Md6-2A The taste is medicinal in a more medicinal way than medicine. I enjoyed your take on the 10 Worst Candies, and many thanks for your good-humored comment! I’ll say horehound is an acquired taste– and I’ve had both varieties. I much prefer them with cane sugar than corn syrup, however. And I would definitely pick up the tab! Waiter! A snail for this accomplished artist– and make it look like this!! My dear Carolyn! You have proved, conclusively I think, that when it comes to compiling a menu, you have no equal!! Dead Horse, Maggot Bag… I shall be eating peanut butter sandwiches for a month, and trying not to think about it!! I’ll have you know Mark I’ve been wracking my brain over this since yesterday and I’m still mulling it over. What a great topic. I’m sure you know more New England-isms than I do, but it occurred to me that the Massachusetts folks are more known for their accents than their food names. In our house you might hear us say “Have you seen the Utz to go with the gwak and the Seadawg”? Usually uttered before a Red Sox game. My partner’s mother (they are both German), did use the term “Schnecken” for the sweet rolls. Better to keep the 2 separate. By the way, I do enjoy cooked escargots (snails). Very French. Thanks, Jean, always great to see you! I think it’s boring here in the upper-right quadrant of Ohio, Mark, because I can’t think of anything out of the ordinary. Now you have me hungry for cinnamon rolls. Where can I get one at 11:11 in the evening? You are sooo sweet! A complimentary comment and a complimentary loaf of slightly stale raisin bread. Thank you! As a German I didn’t even have to do any research. Schnecken (plural of Schnecke) as cinnamon rolls are very common. You don’t associate them with those slimey creatures at all, because you wouldn’t get those at the baker’s. Just at fancy French restaurants. Chaqu’un à son gôut… BTW – snail mail is Schneckenpost in German.